Ok, we are all about anything nerdy and internet related. This definitely includes the 2015 classic Tetris world championships. Let us back up a bit and explain where this all started. In 2010 Director adam Cornelious and 3rd place competitor in the 1990 nintendo world championships Robin Mehara decided to set out on a journey to find out who is the best tetris player in the world for classic nes tetris. Previously there had not been any competition to determine one. There were champions for games accross the board including Donkey Kong, super mario bros, pacman, asteroids, all kinds of games. But none for tetris. This is a game that more then 10 million people have downloaded onto their phone! It is safe to assume that most of us have played tetris in one for or the other. This thought prompted adam and robin to seek out the best and film the experience which turned into the Tetris movie or “Ecstasy Of Order”. 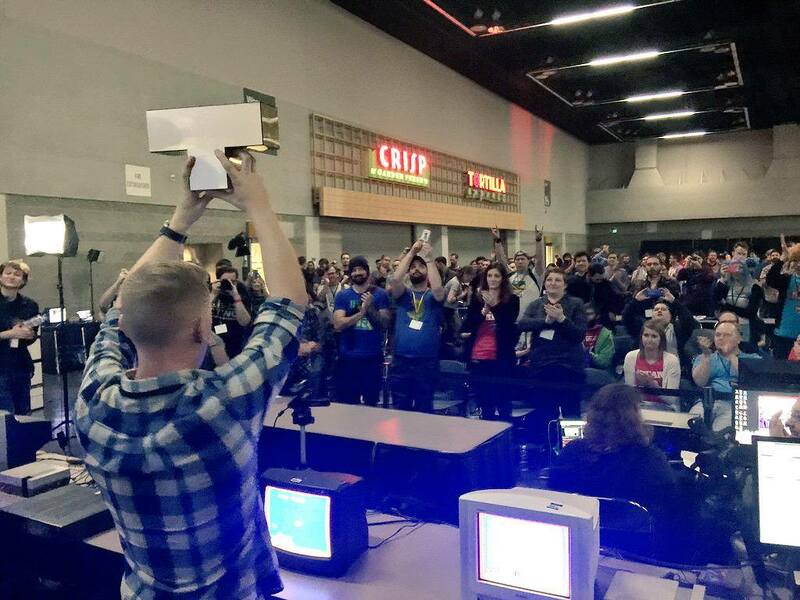 Robin played a large role in finding past competitors in the nintendo world championship to come and compete. Tracking down the best, was no easy task as some had not been heard from in over 20 years. They traveled across the US to find the best of the best and interview them as well as invite them to the first Tetris World Championships. The second place the looked for players were the Twin Galaxies current record holders for classic NES Tetris. You would imagine this is a great starting point. Just about every record holder agreed to come to the first competition in Los Angeles Ca. Trying to round up 10-20 of the best in the world is not as easy as one would think. Amazingly enough, most everyone came. The event got the blessing and support from Blue Planet (current owner of “Tetris”) and worked out pretty well in the end (Im not going to tell you everything). Unknown players emerged in the process and plenty of excitement and drama were caught in the film. If for nothing more, you got a great education on what playing Tetris daily can do for you to help with brain stimulation. I wasn’t sure what to think going into watching the Tetris Movie other then maybe just another King Of Kong, but I was pleasantly surprised as it took a little different path then K of K. I’m glad that it did as originality is great these days. This movie became a cult classic and spurred on a yearly Tetris World Championships which bounced around a bit till it found it’s home and the Portland Retro Gaming Expo in Oregon. Every year around October all the best players gather including a lot of new blood and compete for the cash and title. Records in classic Tetris have been smashed across the board since the release of the movie. People who have never played the game are now masters at it. Even I have started to play it more and am improving rapidly. The hand eye coordination the old video games systems demand you to learn is so valuable in everyday life. Talk about keeping the motor skills working! Practice this game on level 19 everyday, you can’t help but get quick at reaction times and processing information quickly. This movies really left me feeling good after and seeing what has become of it is amazing! I’m going to put the trailer clip below so you can check it out for yourself. Go click on their socials and see who the current champions are and what kind of scores they are setting. I was excited to write about something as fun as this and I hope you enjoy not only this article, but the trailer. Leave them some good feedback and be sure to comment below.